You are here: Home / Natural Living / Can you have too much iron? For the last several decades, iron supplements have been routinely handed out like candy. Because iron is a basic requirement for cell growth and longevity, it is often assumed that people should supplement with extra iron. However, this faulty belief may carry serious health risks. There is such a thing as too much iron. In one Finnish study of more than 2,000 individuals, researchers found that too much iron stored in the body was more strongly linked to heart attack risk than either high blood pressure or high cholesterol. It is believed that women who menstruate regularly are less likely to experience heart attacks because iron levels are reduced by the loss of blood each month. The same line of logic explains why men who donate blood regularly also experience fewer heart attacks. One study showed that iron supplementation disrupted the balance of gut flora in children. Children who were given iron supplements showed an increase in harmful bacteria and a decrease in beneficial bacteria due to too much iron. Research indicates that lower levels of iron can actually be protective against infectious disease, leukemia and lymphatic cancers. Other studies demonstrate that too much iron produces free radicals which accelerate the aging process. It is easy to see why high iron is a common problem these days, when you consider that the modern diet is heavy in muscle meats and countless foods which contain added iron. Typical staples in the American diet – such as breads, pastas and cereals – are required by federal law to be enriched with added iron. In addition, iron is also present in many multivitamin and mineral supplements. A common misconception is that anemia is directly linked to iron deficiency, so iron supplements are often the first line of defense when anemia is suspected. However, anemia can be caused by other factors as well, such as reduced thyroid function and vitamin B12 deficiency. Supplementing iron in these cases is unnecessary and can exacerbate the problem by not treating the true underlying issue. It is far more logical to recommend iron supplementation only when tests show an actual deficiency in iron. Using hemoglobin or red blood cell tests to determine iron deficiency may not only be inaccurate, but could be harmful if iron supplementation is given when it is not needed. Is Sugar as Bad As You Think? This article was originally published by Elizabeth Walling (that’s me!) at Natural News here. I read an article by Bill Sardi that stated the same thing. 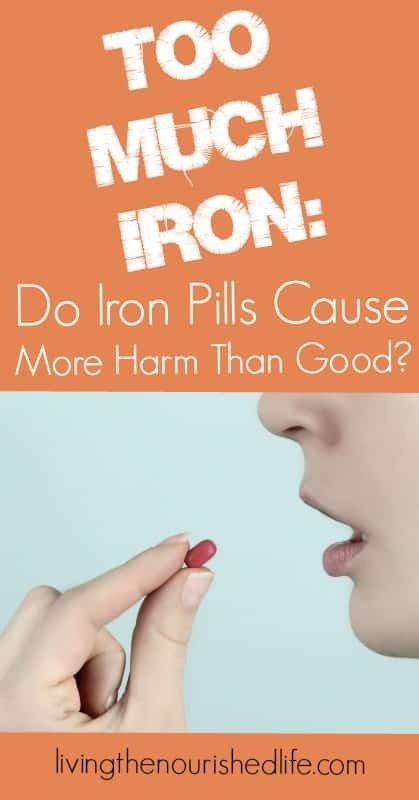 It specifically stressed that men, due to not having any blood loss, are most at risk of having too much iron. Dr. Mercola also wrote about it. They both agreed that donating blood was a good way to prevent the iron levels in the blood from becoming too high. I also heard yesterday that Dr. Oz was pushing more iron for preventing hair loss in men. I think preventing a heart attack is better than preventing hair loss. I’m sure hair loss has other causes anyways. I cook with my cast iron skillet a lot– I’m rethinking that. Yes, this is definitely a concern for men (and women who don’t menstruate). I cook with cast iron less than I used to because of the iron issue, but I still use it for a few recipes that work well with cast iron (like skillet cornbread!). Thanks for this info 🙂 I am just wanting to follow the links provided at the bottom but they dont seem to be listed in full. 2)Why under hypothyroid conditions the body down regulates the iron ? Thanks for your questions, Susana. Iron supplementation is a really individual thing, so I can’t really say whether they are beneficial for an individual or not. I personally would try to rely on diet for iron intake if possible. As far as I know “iron saturation index” may be a better way to measure iron levels. Low thyroid or metabolic function is connected to most of the common symptoms of anemia like cold hands and feet, low energy, poor concentration, etc. It’s important to know if these symptoms are related to poor thyroid function or other nutritional deficiencies, not just iron. 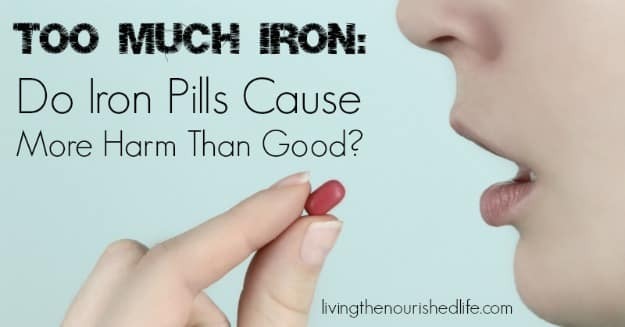 For me personally, if iron wasn’t helping my tests then I would start looking for other possible problems that could contribute to my symptoms. Have you checked your basal temperature? If it’s low that could indicate low thyroid function. I’ve never been able to take even a multivitamin with iron in it. I’ve never been able to understand why they push it so much for women. Thanks for the info.